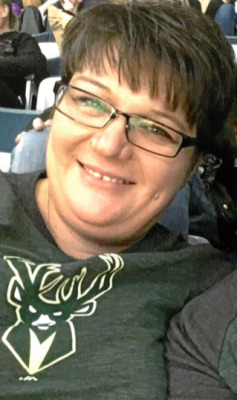 Angela S. Titus, age 44 of West Allis, Wisconsin passed away unexpectedly Monday, March 18, 2019 at the Aurora St. Luke’s Medical Center in Milwaukee with her beloved husband by her side. Angie was born August 3, 1974 in Hartford, WI to Pam S. (nee Stefan) and Tim J. Crimmings. She graduated Horicon High School, class of 1992. She was due to graduate from the Milwaukee Area Technical College this spring with an associate degree, Medical Administrative Specialist. She was advancing in her career at St. John’s on the Lake, Milwaukee as an activity’s coordinator. She was extremely devoted to her job and loved it. Angie was united in marriage to her beloved husband, Wilson Titus III on September 15, 2017 in Fairfield, California. She will be remembered dearly for her love of: the Milwaukee Bucks and the Chicago Bears, one of her favorite bands- 2Cellos, camping, fishing, and smoking meat on her new smoker. Most of all, Angie loved her family, especially her therapy dog, Tank (who went to work with her every day), and her world, her nieces and nephews who she would do anything for. Angie is survived by her beloved husband, Wilson; loving parents, Pam and Tim Crimmings; loving brother and sister, Alex Crimmings and Michelle (Mike) Black; cherished nieces and nephews, Mackenzie, Wyatt, Adelynn, Taylor, Cody, and Peyton; dear mother-in-law, Beverly Bogan and her favorite father-in-law, Wilson Titus III; dear siblings-in-law, Melissa Crimmings, Jeana (Morris) Bodden and Michelle Bogan; and her special fur baby, Tank. She is further survived by loved aunts, uncles, cousins, many treasured residents, relatives and friends. She is preceded in death by her maternal and paternal grandparents, an uncle; and step-father-in-law, Clayton Bogan Jr.
Funeral Services for Angie will be held Friday, March 22, 2019 at 5:00p.m. at the Shimon Funeral Home (824 Union Street Hartford, WI 53027) with Reverend Jana Troutman-Miller. Family will greet relatives and friends at the funeral home on Friday from 3:00-4:45p.m. In lieu of flowers, memorial contributions in Angela's name to the Alzheimer's Association- Southeastern WI Chapter (620 S. 76th Street, Ste 160, Milwaukee, WI 53214) and are sincerely appreciated. A walk for pancreatic cancer will be coordinated in the future, please join Angela's family in her memory. To send flowers or a remembrance gift to the family of Angela Sue Titus, please visit our Tribute Store. "Email Address" would like to share the life celebration of Angela Sue Titus. Click on the "link" to go to share a favorite memory or leave a condolence message for the family.